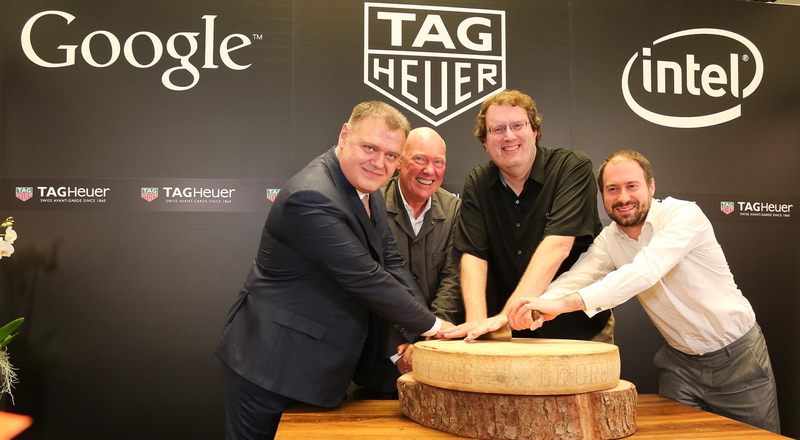 TAG Heuer took the stage at Baselworld 2015 to announce a groundbreaking partnership with Silicon Valley giants Google and Intel. Together, they will design a Swiss smartwatch, drawing on their respective expertise in luxury watchmaking, software and hardware. Jean-Claude Biver, President of the LVMH Watch Division and CEO of TAG Heuer, David Singleton, Director of Engineering for Android Wear, and Michael Bell, Corporate Vice President and General Manager of Intel’s New Devices Group, joined one another at Baselworld 2015 to announce a game-changing partnership in the world of watchmaking. The three companies will team up to create the first smartwatch to integrate Swiss watchmaking expertise with the technological prowess of Silicon Valley. As leaders in their respective industries, the partners will combine their expertise to invent a device on the cusp of innovation and creativity, both a luxury timepiece and a connected digital assistant. Anchored in the artisanal excellence of TAG Heuer’s timepieces, this Swiss smartwatch will be powered by Intel chips and Google Android Wear. The TAG Heuer smartwatch is expected to be released by the end of 2015.